The S unburst Award for Canadian Literature of the Fantastic is a prized and juried award presented annually. 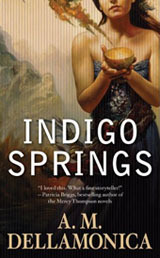 It is based on excellence of writing and awarded to a Canadian writer who has published a speculative fiction novel or book-length collection any time during the previous calendar year. 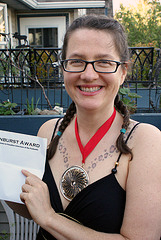 Named after the novel by Phyllis Gotlieb (1926-2009), one of the first published authors of contemporary Canadian speculative fiction, the award consists of a cash prize of $1,000 and a hand-crafted medallion which incorporates a "Sunburst" logo, designed by Marcel Gagné. The Sunburst jury said: "When Astrid returns to the town of Indigo Springs and to the house she has inherited from her father, accompanied by Sahara, the girlfriend she has a crush on, and Jake, her platonic buddy who has a crush on her, she finds that, far from being the dissipated drunk the town thought him, her father was a crafter of magical objects called 'chantments,' using the power of the mysterious spring of blue waters beneath the house. When Astrid and Sahara learn to use the power for themselves, they discover the magic is both addictive and transformative. As their power grows, their experiments escalate into an ecological crisis ... and open an unbridgeable chasm between them. "Original, passionate, lyrical and powerful, entertaining and terrifying at once, Dellamonica's debut novel examines how both good intentions and good people can be overthrown by the temptations of power." 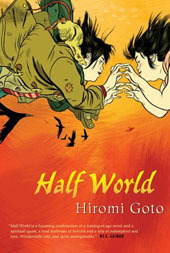 About Half World, the Sunburst Jury said: "After her mother suddenly disappears, unpopular oddball Melanie Tamaki accidentally discovers that she is a refugee from Half World, a Boschian third dimension between the worlds of Spirit and Flesh where dead people work out their karmic issues through chaos and entropy. Beyond the hypnagogic wonders of the Half World setting and the clever yet unobtrusive cosmology of its concept, this is a mother-daughter story, a fact which of itself sets the novel apart, for few such are written. Most YA novels focus on peer relationships; Half World does too, but Melanie's best friend is a shape-shifting jade rat pendant.